Triad on-wall passive LCR speaker. PLAYBAR, The soundbar for music lovers. Triad's newest and smallest 3-in-1 onwall speaker is designed for use with ultra flat-panel televisions and measures 1.6-inches deep by 3-� inches high and available in custom widths to match the length of any TV. 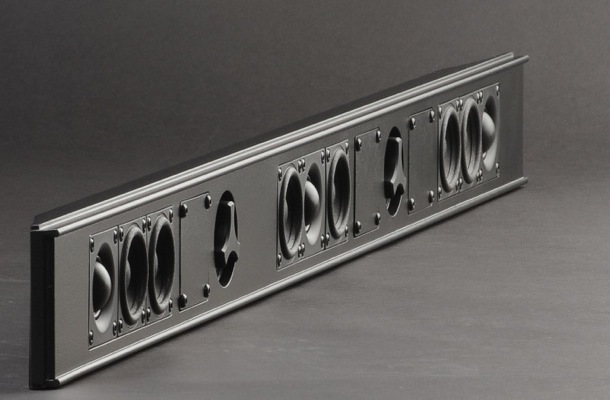 The Nano LCR 3.0 incorporates 6 specially designed Scan-Speak drivers and 3 soft dome SB tweeters in a fully-damped and braced aluminum enclosure. When used without a subwoofer, sound is full and clear, with robust output. Augmenting the Nano LCR 3.0 with one of our OmniSubs or many InWall or InCeiling subs makes for great home theater performance. In addition to the standard width, custom versions are available (at extra cost) up to a maximum width of 82". Custom paint matching is also available, so we can paint your speaker to match your wall or your TV. . With a variety of installation options, the OnWall Nano LCR 3.0 can mount to the wall or directly to the television with the included Triad TV mount. All Nano LCRs 3.0s are built-to-order expressly for you, one at a time, in America. There's no reason to put up with the mediocre sound provided by today's flat-panel TVs. The OnWall Nano LCR 3.0 is one of the best performer in its class. Width w/grill 44" (111.7cm) Custom length available.